Making sense of all that complicated photo jargon! Photography is all about catching “pieces” of light to create an image with a chemical reaction (on film) or an electrical reaction (digitally). It matters not which medium you use—the basics of controlling light are the same. If you understand and use these basics you will be a better photographer. It will allow you to be able to repeat y our successful images instead of them being happy accidents! These accidentally good images usually happen when you use the Auto modes in your camera. The auto modes are controlled by a little, tiny, rat-like brain, so you get what you get. What I’m proposing is that you take back control of your camera by using the big brain—the big lump two feet above your…well you get the picture. Switch your camera into the manual mode. It’s OK…it will not explode and neither will you! If you want to ease into this a little at a time you could start with one of the semi-manual modes, like aperture priority or shutter priority, which we will discuss later. To function in the world of “M” (manual mode) you need to understand the exposure triangle. The three sides of this triangle are: Shutter Speed, Aperture (or f-stop) and ISO (“film” speed). Using each side of the triangle either individually or, best of all, in concert with each other can produce stunning images. But first, you need to understand just what each side of the triangle can do for you. 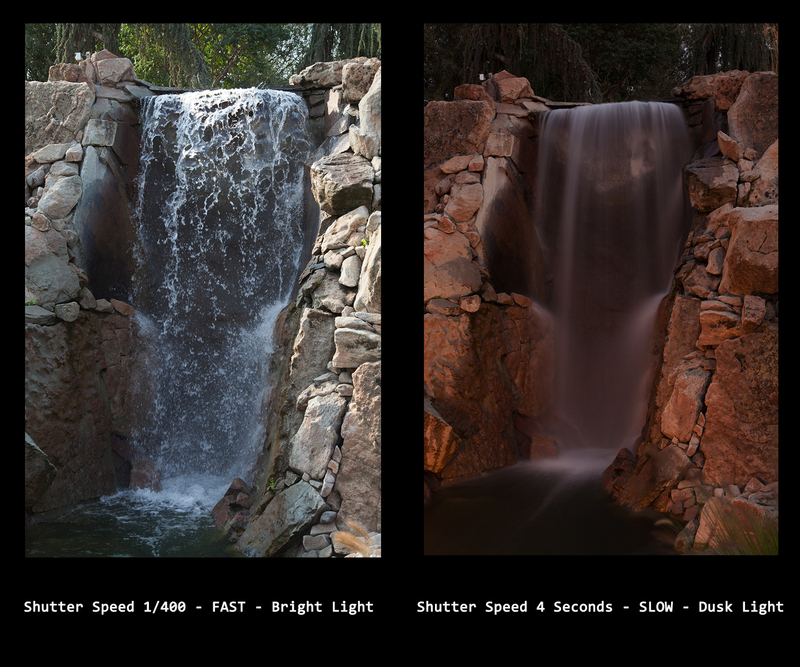 1/1000 One/one thousand of a second – FAST! 1/30 above it because it’s open twice as long. Your camera’s shutter can reveal much that the human eye alone cannot. If you set your camera at say, 1/8000 of a second it can stop the fastest things man has made. By using long exposures, holding the shutter open for 30 seconds or more, your camera can gather enough faint light to reveal tens of thousands more stars than you’ve ever seen before. However, to see these wonders at this shutter speed or any shutter speed longer than 1/15 of a second, you’ll need to mount your camera on a tripod for a sharp, clear image. In the next article we will talk about the second part of the triangle, the aperture or f-stop, and all it’s creative uses. Subtractive lighting simply involves the blocking of unwanted natural light to create a natural three dimensional quality to the lighting on people outside. Subtractive lighting by its nature keeps the subjects married comfortably to their environment keeping the look genuine--and, well, natural! Additive lighting, with flash outdoors, very obviously divorces your subjects from their environment--it pulls them out or appears to bring them forward to the camera--as though the natural background light repels the artificial light of the flash. That's just how it looks and feels to me. 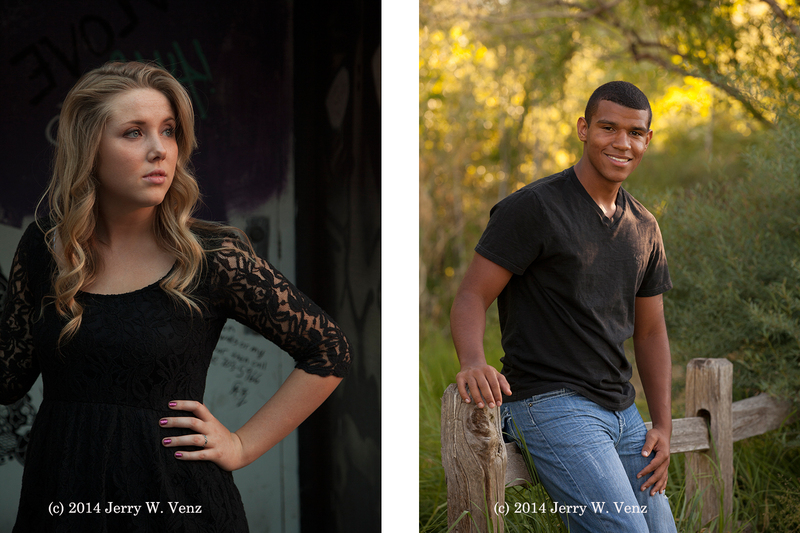 Take a look at my portraits again here and compare them to other photographers using flash outside. Do what you think works best for your clients. A Flag is generally a black flat and refers to something you could hold by hand or mount to a stand. Gobos (from: go-between) as I use them are much larger things that are already on my location; either man-made, like a building, house, porch--or something natural like a tree, a forest or hedges. So, revisiting my images from the previous 2 blogs plus a new one, I've added some data and short descriptions about the subtractive light used. Enjoy and feel free to ask any questions on this topic. 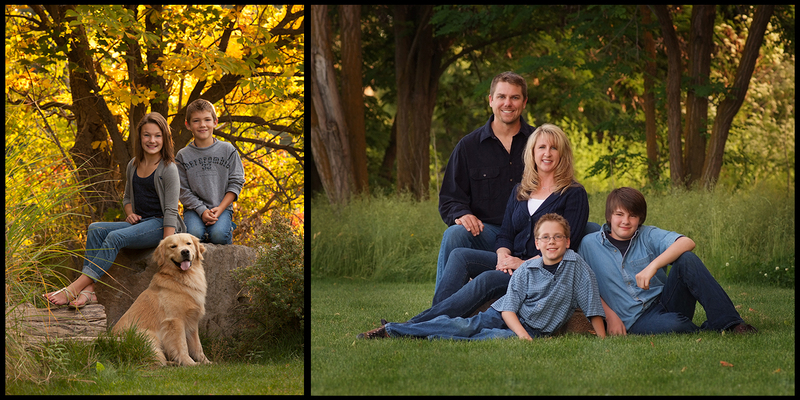 2 kids with Dog - F6.3 @ 1/100 sec at 400 ISO, Lens 70-200/2.8 at 200mm - Gobo/trees on left with open sky on right Family - f6.3 @ 1/100 sec at 400 ISO, Lens 70-200/2.8 at 145mm - Gobo/trees on right with open sky on left. Sun setting behind me and to right of trees/gobo. Young Boy - f5.0 @ 1/160 sec at 400 ISO, Lens 70-200/2.8 at 175mm - Gobo/trees on left with open sky on right Young Girl - f5.6 @ 1/125 sec at 400 ISO, Lens 80-200/2.8 at 200mm, - Distant trees on left with open sky behind me and on right. Straight natural light, too far from trees for a proper gobo effect; placed her here for the color background and bokeh I wanted. Teenage Girl - f5.0 @ 1/125 sec at 400 ISO, Lens 24-105/4.0 at 73mm - Deep in an alley with light coming from both sides (sun setting on left) We used a black flat to gobo light on her left. Sunlight was bouncing off the tall building on right as main light. Teenage Boy - f5.0 @ 1/125 sec at 400 ISO, Lens 70-200/2.8 at 150mm, - Gobo/trees on left with open sky on right. By: Jerry W. Venz, Excerpted from my forth coming book: The Best Light Money Can't Buy! 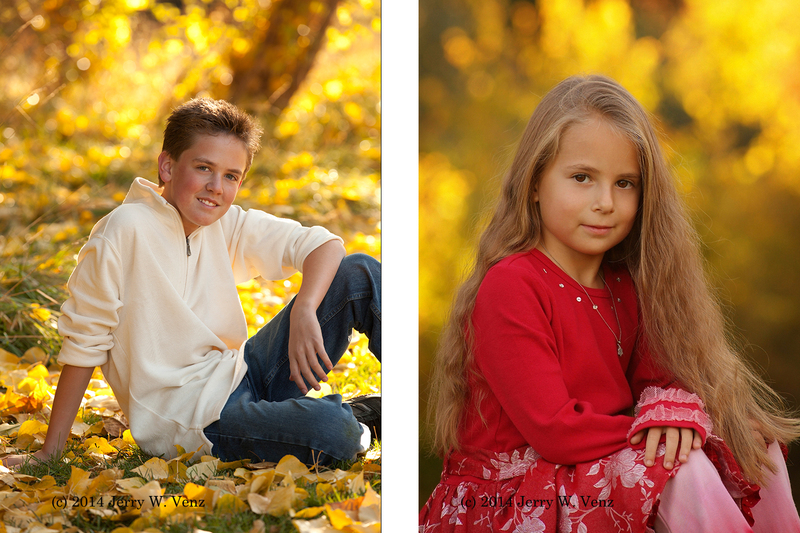 1) Natural Light is simply the best light for portraits--Period! 3) On the practical side, save yourself the cost of buying several speed lights (which aren't good for anything except weddings and events), radio flash triggers, stands, sandbags, portable soft box and reflectors. 4) I don't even use reflectors outside; only gobos (to block surplus light). If you think you need a reflector it means you've placed your subject in the wrong spot. 5) Put all this money (that's thousands of dollars!) saved and buy real professional flash gear and put it where it belongs--in your studio! 6) Travel lighter and, without needing to use your precious waning light setting-up all that flash gear, you can actually do more photography. 7) Get the image! When photographing difficult subjects, like children and pets, you can't wait for a battery powered flash to recycle--they're just too damn slow! Often the best expression is the one that happens 1/2 second after you click the shutter and since NO battery powered flash can recycle that fast you're not going to get the perfect image. 8) That's presupposing your radio flash triggers are 100% reliable; are they? 9) Is all this hardware really helping your subject to relax and enjoy their portrait experience? 10) Since I know all this equipment isn't necessary what's the point? Is this about showing off? Are you wowing your clients with your hardware and your technology? HOW ABOUT WOWING THEM WITH GREAT IMAGES! All we’re seeing out there on the education circuit is the push to use speed lights for everything. As though there’s no other alternative! Every time we go on location outdoors we see photographers walk past great locations into god-awful spots with dead backgrounds, dull flat light and blast away with their speed lights. And, what’s most galling is these photographers call themselves “natural light” photographers just because they’re outside! I personally think that this fad is being driven by the camera industry that sponsors all the circuit speakers to endorse their products. What professional studio photographer would ever consider using speedlights in their studio? And, yet they’re using them outside! It’s not like anybody is saving any money using speedlights. Even the best speedlights put out so little light, you need more than one. I see photographers using up to four speedlights in special mounts for their outdoor soft boxes giving them one under-powered main light costing over two thousand dollars! And that’s not counting the cost of radio transmitters and receiver rigs that you also need to run them. If you are doing commercial photography and don’t have control of time of day, investing in portable studio lighting would be more cost effective, but you still need to learn how to properly use them as well. If you are out in the magic hour, when the light is perfect, you don’t need a flash, when you’ve placed your subjects properly. It’s as though many photographers don’t trust their eyes to use natural light and so ironically they resort to using a light source that is too fast for their eyes to evaluate! One of the cornerstones we intend to teach is how to evaluate light on location, weather outside or inside, and then where to place your subject within that environment to take advantage of the natural fall of light. The other irony is that our tools for capturing natural light have never been better. Our cameras are superb at higher ISOs and coupled with faster f2.8 portrait lenses it’s easier than ever before to use this beautiful natural light. The most important thing is what we hear our clients say when we show them their portraits, on the back of our camera, during a session, “WOW, that’s gorgeous!” We’re here to help you hear the WOW!